For now I'm keeping the prices at £11.99 (currently around $15.50 in US dollars) which I'm considering to be an introductory price, and they may rise to £14.99 in the future. These aren't mass produced or are big, bulk orders, so each time a sale comes in I need to manually pack the work and drive to the post office to get it shipped out and think £14.99 is a reasonable price for art and print collectors to pay who can't get to me at the occasional comic con I attend each year here in the UK. If you'd like to purchase more than 1, I'm also running an offer: 3 prints for for £24.99. Just mention the names of the prints you'd like (currently available in the store) when you get to the order checkout stage and I'll have them sent together. This is pretty much a buy 2 get 1 free offer, saving £10.98 along with reduced shipping cost if buying individually. And speaking of shipping and postage costs, it's £3 to send a single print in the UK and £8 to the USA for example. I don't make any profit on shipping. If anything, a small loss but I know how annoying shipping costs can be so want to keep this as low as I can. What do you listen to while you draw? For me personally it depends on my concentration level. For maximum concentration when working on challenging artwork, silence is best. When things ease up, instrumental music (no lyrics). Songs with lyrics or Podcasts are for when I draw something more routine when my brain is in less demand and I’m more able to take in information. How to you make sure inked art doesn't smudge? How on earth do you make your drawings so clean? Whenever I erase the pencil lines on mine, it smudges. I know the feeling. Smudges are so annoying and I still get them from time to time. I usually wait a few hours before erasing pencil lines to make sure the ink is dry. Another tip is to carefully sandwiching a piece of toilet paper or paper towel between sketchbook pages can help it dry quicker and reduce smudges. Too much graphite from pencil lines can cause the ink to sit on top of it and then smears, so lighter or less pencil strokes can help. And lastly, try experimenting with different pens and papers. As soon as you find a good combination, you know you're good to go for life. For those of us who can't get to Photoshop, what tools (color pencils, marker, paint or etc...) have you worked with to get really bright/shiny colors? Do I need a Drawing Glove for my Digital Art? Originally smudge guard gloves were used to prevent graphite smudges on paper then became a thing for digital artist to minimise friction and to avoid a sweaty hands on a graphics tablet - particularly screen based tablets like a Cintiq. If I'm just doing, say, 20 minutes of touch ups I don't put mine on, but for longer sittings I find it very useful. Just gotta ask yourself, are you finding it a bit annoying when your hand or fingers aren't gliding around the screen so much? If so, buy one and try it out. They're not too expensive and come as single gloves (not a pair) with either one (pinky) or two fingers covered (pinky and ring finger). How do I bring my characters to to life- giving them personality and story time? You could try writing down what you want from a character before even putting pencil to paper. Ask the question- what do they do and what to they want out of life? Then ask yourself how could I represent this? For example, a mechanic will be dressed more practically and isn’t going to be too concerned if they look dishevelled and dirty, where as a princess from an upper-class aristocracy will more likely be well-presented, perhaps with a big, flowing dress where practicality is secondary. Are they lazy or indifferent? Determined and ambitious? Happy and energetic? These traits can effect their pose, facial expression or even physique. I think once you can build a mental picture of what you want from your character, you can then start sketching with an objective and you’ll have something specific to aim for, opposed to doodling without any focus. What type of art request do you immediately say no to? Regardless of whether you're being paid or not? I'll turn down anyone who uses the line "I won't pay you but It'll be great exposure for you". They might as well just say, "I don't like to adequately compensate professionals for their time and expertise and I think artists are so dumb and worthless that they will settle for a credit in a project no one's ever heard or probably never will". If there's a question you'd like answered relating to art, or digital illustration, feel free to contact me or leave a comment. How do you become an actual artist? How do I become a manga artist? Thanks for the question and you're not intruding at all. The way I got my stuff published was kind of unconventional. I don’t want to lie to people or give the usual non-specific BS of “work hard at school and it’ll all pay off” or “post your work on the internet and perhaps you’ll be discovered by a publisher” - That one almost NEVER happens in this day and age I’m afraid. So for me- it was a case of creating artwork, posting it online, then a simple case of luck! Being in the right place at the right time. Also being willing to take the opportunity that arose. Luck can happen at any time, so in the mean time, I’d suggest improving your skills and being patient. Everyone’s path to success will differ. There’s the social media route to raise your profile and allow people to find you- Some develop a Youtube channel and invest 1000s of hours into creating unique content for it, others Instagram, Tumblr, Facebook, or art specific sites like Deviantart and Behance. Or try being bold- write to publishers and companies directly to pitch your ideas and portfolio and expect 100 rejection letters or non-responses before you succeed, or if that doesn’t work, move on to something else. I’d say just keep trying things. Think outside the box. For most artists expect a massive chunk of your time to go into marketing, trial and error business ventures or experiments in order to get noticed or profit from your art. Or maybe you’ll also find some luck. Perhaps entering a competition to create a serialized manga, which ends up landing you a full-time gig? Look out for stuff like that too. Where can I purchase cheap bulk Prints? I recently went to an art market/mini Comicon thing in my hometown, and I'm thinking about selling some of my stuff there next year. But then I thought....how do I get cheap bulk prints of my work to sell there? Any suggestions? Great- Give it a go! I'm always interested to hear how people get on at events. So far as prints go, I have a large format printer so can print my own. This helps since I can produce small quantities to test the waters and not over-stock. Googling ‘custom poster prints’ or ‘giclee prints company’ in your country might be the way to go. Searching for those terms on eBay might even be an idea. How much does your art cost? I have prints and original pencil drawings available to buy at in the Shop. If you’d like to commission me to draw your character, logo, mascot, or work on your project, the best thing to do is send me a brief/description of what you’d like and I can provide a quote. A head shot for example might be less than half the price of a full-body image so it’s it’s best if I give a price once I know what needs creating. Head over to the Hire Me section for me info. 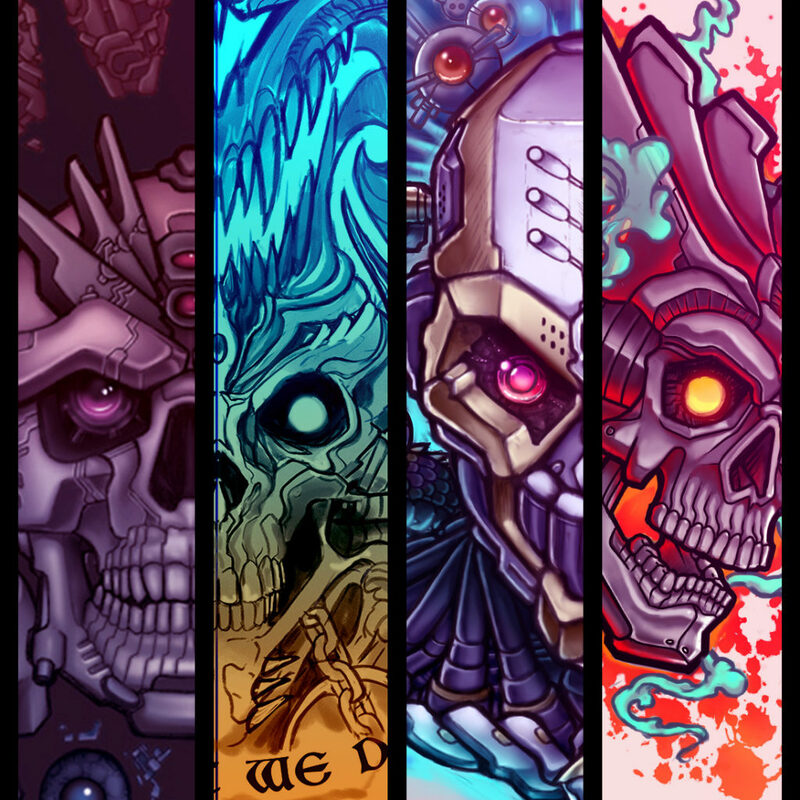 Here's a cropped and grouped collection of some of my digital art. Some bits dating back to as early as 2001 and others I'd done over recent years. Kind of interesting to see the different styles I've played with over the decades and crazy to think how long I've been doing the whole art thing for. It seems pretty common for artists to look at their older artwork with shame and embarrassment, but while I might notice a few flaws and things I'd do little different now, to be honest, I still kinda like a lot of it. How should I handle criticisms of my design? Every artist will get criticised at some point- it’s to be expected. And it’s common for clients to not be satisfied with your work on the first attempt every time. Even though it’s often not personal, I always still find it frustrating when having produced a great piece of work (as far as I’m concerned) to then be told it needs amending. If a client is stressing me out with changes and criticisms, I take a break, talk to my friends or do something else for a while to calm myself down. If it’s trolling, you have to do your best to ignore it. Do you work individually or do you work with other team of designers? Almost always I’m on my own, which is the nature of freelancing. I’ve worked in-house on web design projects in the past, but these days it’s not common. I might liaise with another graphic designer or art director, but this is often only ever over email. Have you worked with any print media before? Many times. Other than my how-to books, I’ve created art and designs for magazine covers, posters, leaflets, apparel and gift items. There are certain considerations to think about when working for print compared to web, for example; print resolution, colours models such as CMYK, calibrating your screen and digital set up to mirror print profiles and reproduce your work as accurately as possible. I explain these in my book ‘Digital Manga’. How have you been able to manage your time ensuring you have time for your family and friends? It can be difficult when you freelance- you don’t always have the opportunity to work set hours. If there are deadlines to meet, you must work long days to compete the task. However, I also get quiet periods when there is not much work and I use those times for social and leisure time. Having said that, I make sure not to overload myself and not work those crazy long hour days if I can help it. I’d rather have less money and a life than become a work machine. Are there other people's designs that you admire, what is unique about their designs? Sure. I love looking at art even more than producing my own! I’m a big fan of both eastern manga artists, and western comic artists, illustrators, graphic designers, tattoo artists and concept artists. Too many to name. The uniqueness is hard to pin point. It often comes from the attention to detail and flourishes added which gives the creation more depth, interest and vibrancy than a typical, bland piece of work. What are the major qualities of a good artist/designer? Every designer will have their own unique qualities and skills they can bring to a project. Universally we all share a love for art, visual communication, creating and aesthetics. A good artist is never satisfied with their current level of ability and aspires to improve and achieve a high standard of work. Any Ghost in the Shell fans? I started working on a new bit of fanart a while back and thought it was about time I added some progress shots to my blog. 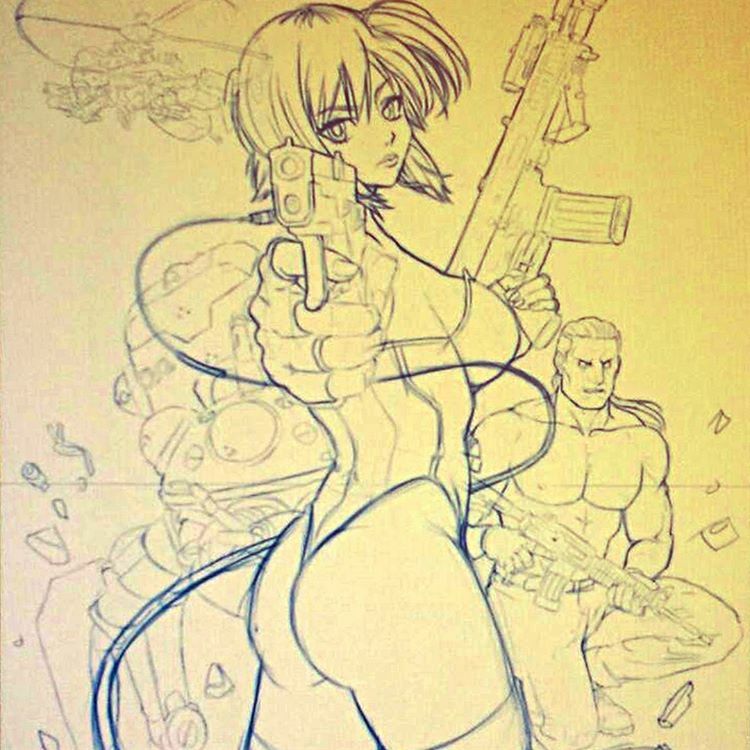 I've been a fan of Shirow's (Creator of the Ghost in the Shell manga) work for 25 years or so. The first anime movie wasn't bad, but think they really managed to nail it with the 'Ghost in the Shell: Stand Alone Complex' anime series. Complex is a good word for it as it's not your typical, basic 'good vs evil' plot, but something I'd recommend to older audiences who want a Sci-fi series with a little more depth and intricacy. I wanted to pay some homage to the G.I.T.S. Solid State Society series with this artwork. I usually start sketching in blue. This time straight into Photoshop. I want to go detailed with this piece so using a lot of reference to help out. The orange fade is just to stop it looking a bit dull, but I'd work with blue onto a white canvas. 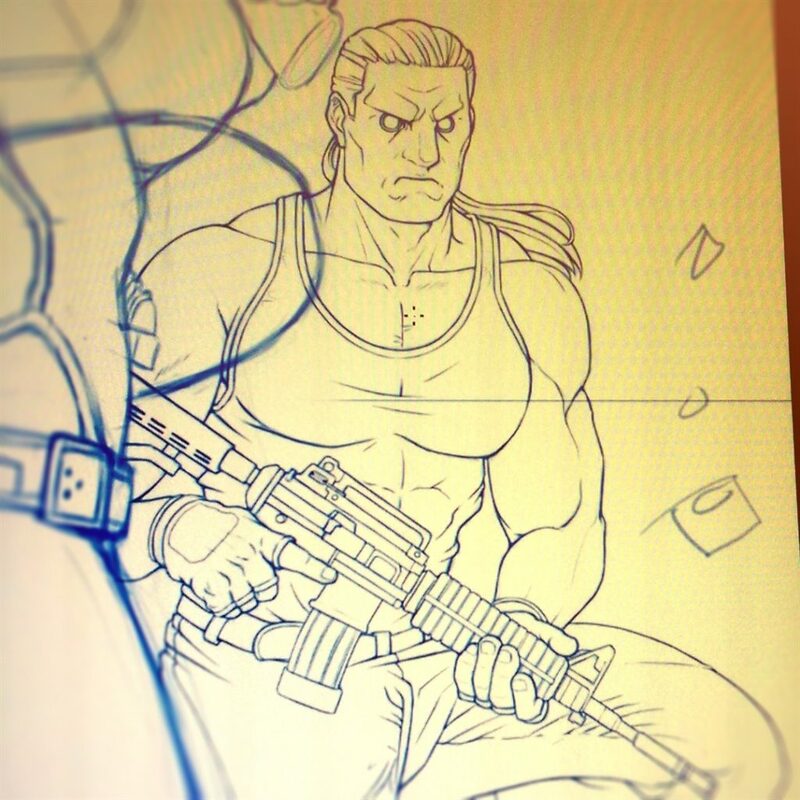 Finished refining the line work for Ghost in the Shell's main male character, Batou. I'll just add, I didn't particularly like him in the GITS live action movie. I didn't really like the movie in general, but I guess worth a watch and helped introduce the mainstream to the franchise. 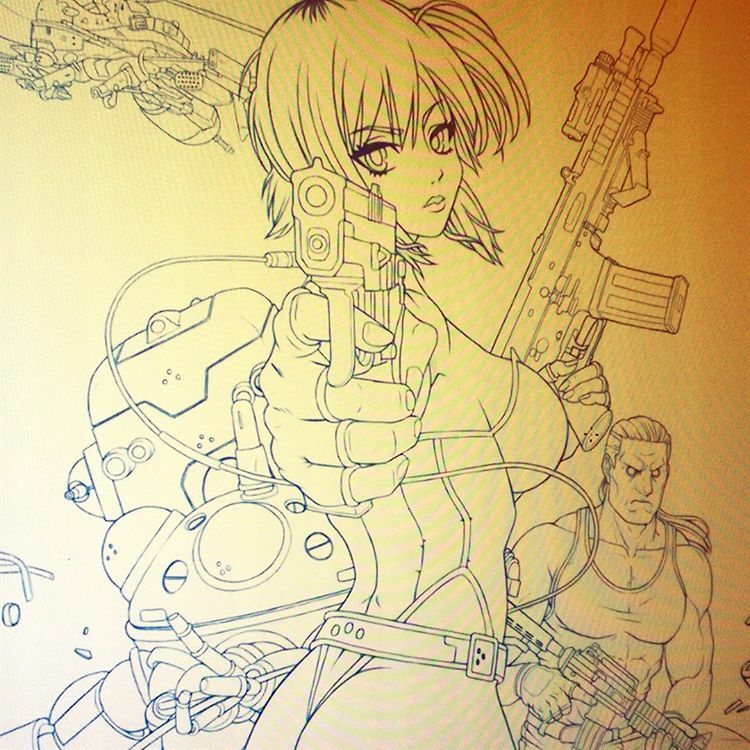 Finished refining the line work for Ghost in the Shell's main character, Major Motoko Kusanagi and Tachicoma robot behind. Finished laying down the base colours. Some artists might leave it there but I don't like the way art looks before I start rendering and adjusting the colour pallet. Began rendering. Usually I'll work my way through rendering each colour, then I'll begin adjusting the pallet, tones and contrast afterwards. It'll be several more hours until I'm finished with this one!.. On the last stretch to finishing, making some tweaks to the Major by zooming in. 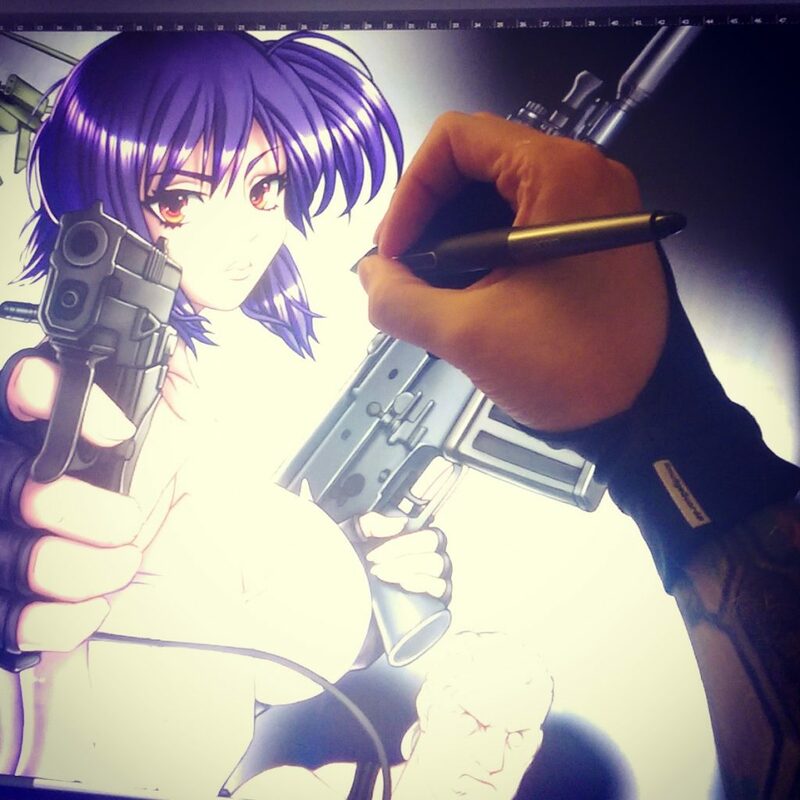 Here you can see me drawing on a Wacom Cintiq 27QHD. Getting paid to draw in Manga style? 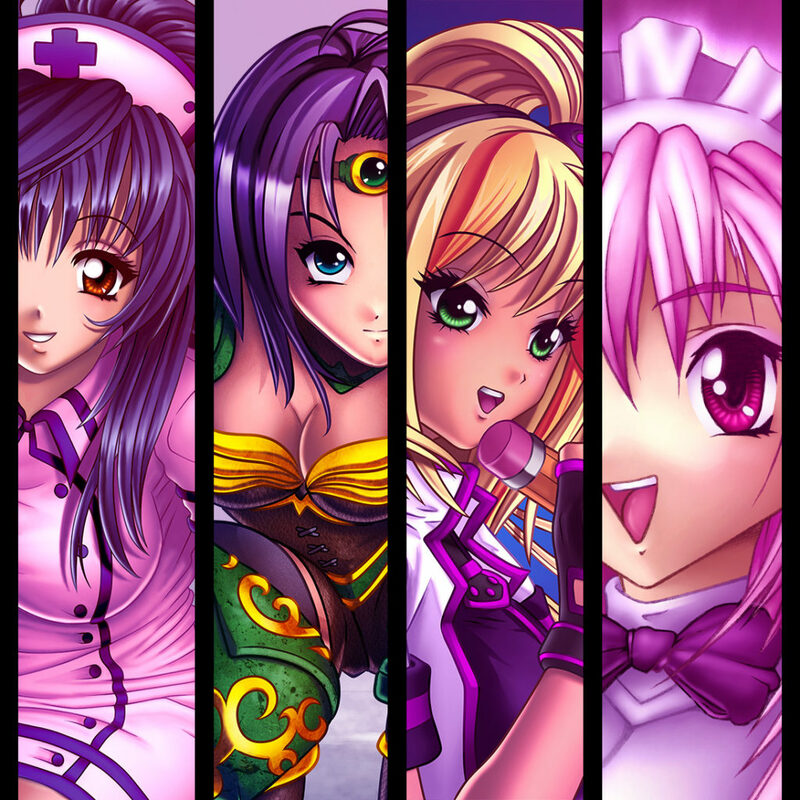 Since you're a freelance, is it difficult for you to find companies in the UK interested in manga drawings and style? 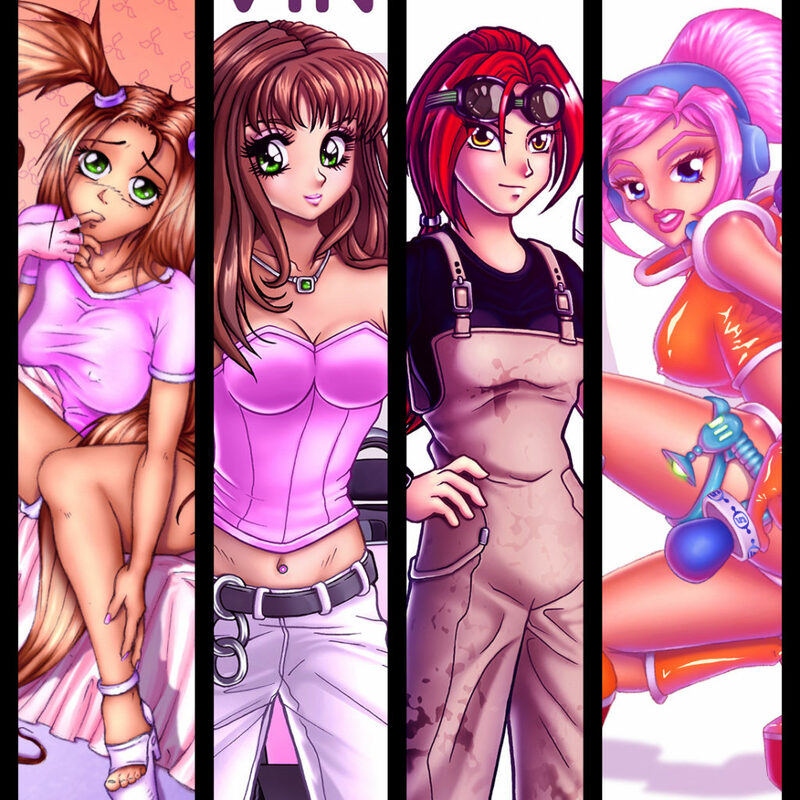 Its harder to find work compared to a more mainstream style (which I also have for customers who want an alternative to manga). 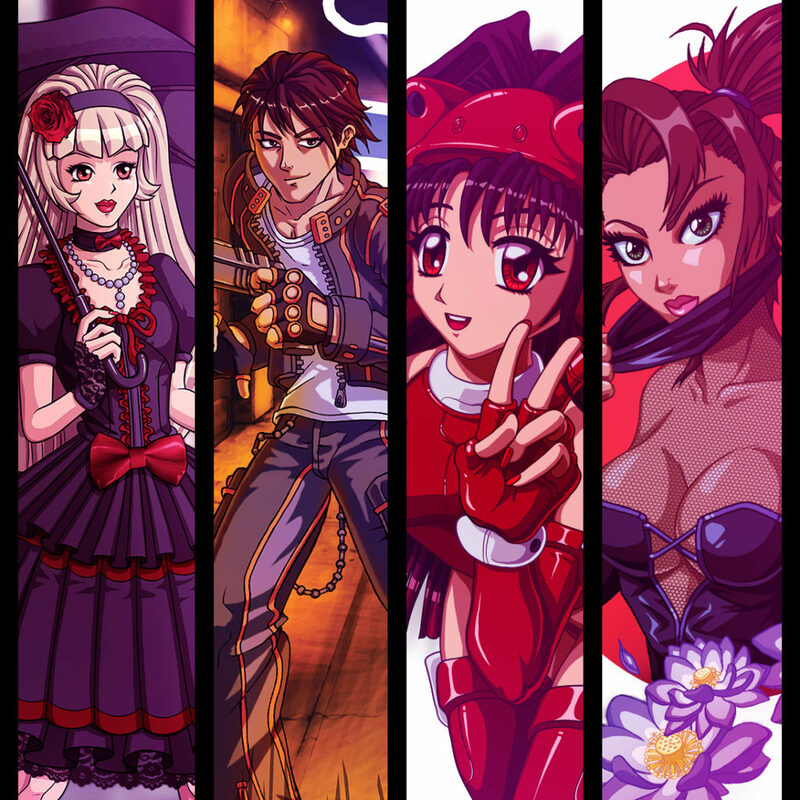 However there is often a company or organisation who will find and contact me specifically asking for manga style artwork for a Japanese themed promotion or event. Speaking of events for example, Hitachi Europe (based in the UK) were exhibiting at a trade show in Holland a few years back and they had opted for a Japanese themed area that year to display their products. These included interactive large screen pen displays. To add to the Japanese flavour, I was hired to draw manga style art on the displays during the event in real time. I would never have expected that kind of work to come about, but goes to show there's a call for manga, even at non-related events. Having this website is the main portal for connecting me with customers. If you haven't already, make one of your own and then attempt to funnel as many prospective employers to it as you can. Are you a fan of Comic Cons? Do you participate in any of them? I really enjoy them, although attending lots throughout the year isn't economically viable for me. I've participated in 17 cons here in the UK to date. If you're an artist interested in participating in any comic conventions, check out my extensive UK Comic Con article. Should I sketch my designs before converting them to digital format? Several years ago it was typical for me to sketch out all my work in pencil before scanning it in and colouring it digitally. To this day there's nothing wrong with that. These days a lot of people are drawing and sketching digitally with a graphic tablet as well colouring, rendering and painting over the top digitally- myself included. The main reason being time saving. The best thing to do is to try different methods and see which works best for you. How long should it take a designer to design a 300x400 banner? That question is too open ended to give a simple or specific answer. If the designer needs to create an intricate illustration, rendered art or animation as a part of that banner along with time for research, idea development and input or changes from a client, it might take 20 or 100 hours+ However a simple text banner created by someone who knows their way around Photoshop or Illustrator might take 5 minutes. Clients need to consider their briefs in detail when hiring an artist or designer. Basic questions like "how much do you charge?" Or "how long does art take?" Are equivalent to "how long is a piece of string?" What inspired you to get into designing? Growing up on a diet of visual entertainment- cartoons, video games and fantasy movies along with a love of aesthetics and a drive to create something of my own. At what age did you first design a marketable graphic? The first time I took on a paid commission online was in 2001 when I was 19. I created an album cover for a rock band featuring the 4 band members as comic book characters. I think I earned around £80 for it. I had been paid to draw a few times before then while at school, painting a little graffiti style character for my teacher's grandchild and a painting my friend's mum's cat! If there's a question you'd like answered relating to art, or digital illustration, feel free to contact me or leave a comment. Check out Art Q&A #1 for more. Does scaling down an image result in quality loss? I know that if you resize images to make them larger the quality of that image is either blurred or not the best quality and loses detail. What if you wish to scale down? Would all the details/quality look blurred? I have been asked by a client to produce art at only 1900x900 pixel dimensions. I would really like to draw on a larger sized canvas but if I size down my image It'll lose any detail? Yes. You will lose detail if you down-scale since you're lessening the pixel information you have in an image. However There is no noticeable quality difference between down-scaling to say 1900x900 and working with those dimensions to begin with. What I would do is work at the largest dimensions possible. Save a copy which you then down-scale to fit. You'll then also always have a higher detail version if needed. How do I create an interesting Manga story ? What are the basics? Is it okay to take reference from other stories (movies songs and so on). I know many stories are based on something else but I am afraid of making it to easy to recognise. How should a good story start ? How do I plan it? Ask yourself what would you like to read about? What kinda stories inspire you? It's fine to borrow ideas. There are loads of time travel stories for example, but each one is told in a different way with a different cast of characters and different scenarios. Start by considering a chapter (20-30) pages and how you would convey your premise and introduce your main characters. Start with rough draft or written script before finalising by moving on to the pencil and ink work. Photoshop or Paint Tool Sai? I really want to take my art to the next level and to get into digital painting and I'm not sure which program is better for that. I've only had brief experiences with both programs so I'm not that familiar with either. I also want to go to art school for animation and graphic design so if either of these programs could help me with that in the long run, that would be great as well. 1. Most companies or universities wont have Sai available or teach it. 2. Photoshop interface is similar in programs like Illustrator and Indesign which you'll use if you also get into graphic design. 3. Photoshop can be used much easier for things like photo editing and texture creation for animation. Sai is an awesome program for art and illustration, but having said that, 4 outta 5 people who recommend it do so on the basis of: "it's easier for beginners", "That's what I've always used", and "It's cheaper". That's fair enough for hobbyists but it has more limitations than advantages over something like PS. I wonder how many professionals in the art, design, animation and illustration industries exclusively use Sai? Probably not that many. Following on from my posts: 'Art theft and stealing images online' and 'Art theft and further criticism of pod sites', I’m raising awareness of online art theft, while battling against sites who have taken and used artwork from me personally, along with hundreds of other artists, without permission. I mentioned my plight on the DeviantArt forums - asking how can I/we, as artists, can stop this? The general opinion was to not upload high quality images on to the net and use watermarking to at least help prevent this. Fair enough advice, and something I'd already started doing anyway. But it was interesting to find many of the replies indicated that they felt the onus was on the artist to minimise the damage beforehand and if the damage had already been done, then tough luck. There was a lack of criticism or interest towards the companies/individuals that steal or the sites which allow them to sell an artist's stolen goods on their platform, or the fact that these platforms (e.g Facebook, Instagram, Aliexpress, Amazon, Ebay) make it difficult to either report cases of copyright infringement or do very little, if anything, to act upon it. Well, there is. But you've got to pay for it. One forum member pointed me at the DCMA - The Digital Millennium Copyright Act which works though a business, whereby if you pay them $199 they will initiate a take-down request to have your content removed from an offending site. For small scale theft this is obviously too high a price to pay. Especially if you're an independent artist living on a tight budget as it is. 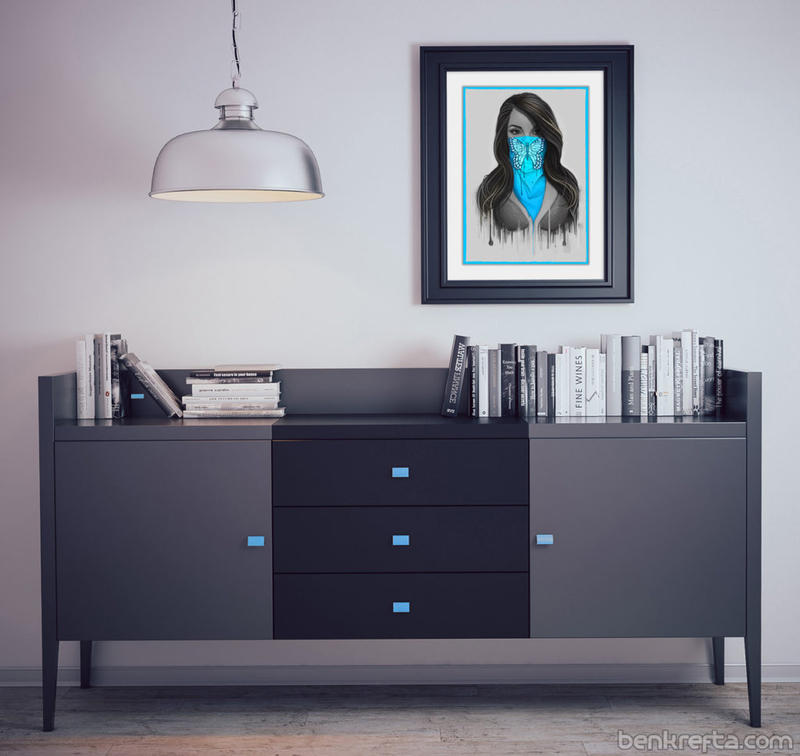 Plus what happens when another site or seller pops up and uses your image? Do you pay yet another $199 to get that one taken down too? It shouldn't be hard to to get offending content taken down- I have a reputation, can prove I created it and have the original Photoshop files or sketches to boot, meanwhile I know for a fact the offending art thief does not have these, and would fail, if asked to produce any kind of written agreement stating permission to use the content in question. And then you just have to look at what else jokers are selling to put things into context- a jumbled mix of artwork produced in various styles, obviously created by a wide range of artists with no mention where the artwork was sourced from, poorly edited or Photoshoped on to products. 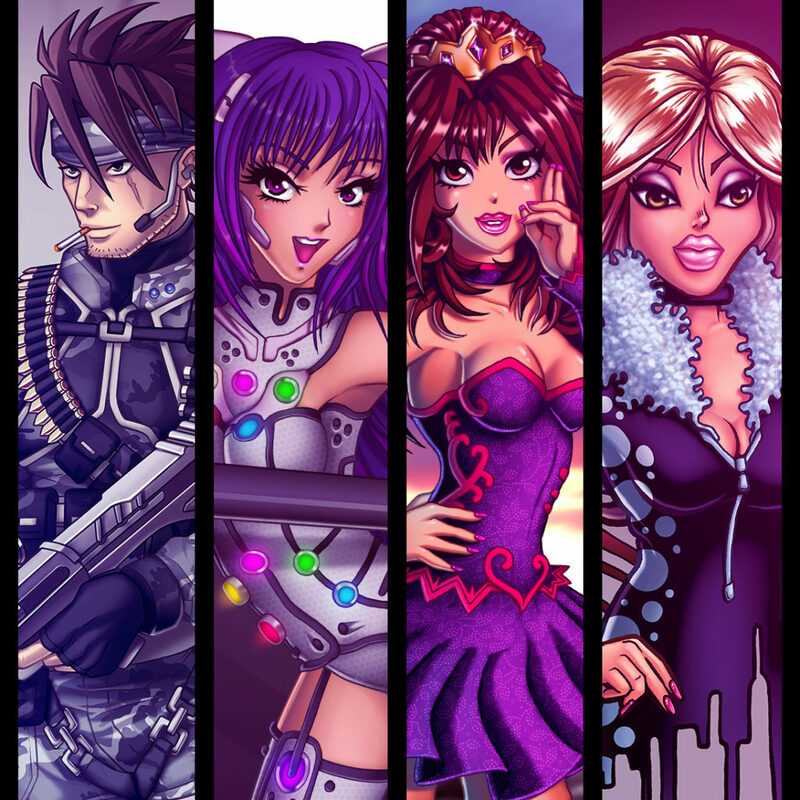 Sometimes still retaining the artist's signature or watermark, which is typically removed if licencing art to third parties. And it's being sold from China through unofficial channels and we all know China doesn't take piracy particularly seriously. So as it stands, according to some artists, the blame seems to be primarily with the artist themselves. If you're a small independent artist being ripped off online, you often can't do much about it. The DCMA is there if you don't mind forking over $200 for help. In a ideal world, perhaps there would be some kind of block-chain system whereby the rights to every image, film or piece of music could be traced back to a registered owner. This information would be embedded into the file itself, with a registry of previous owners being attached to each file. Might sound like a crazy idea, and I haven't spent too much time thinking about how logistically possible such a system would be, but surely help with digital piracy of images, music and video? Someone on social media asked how the could buy me a coffee (donate) to support what I do. Like any artist, I really appreciate any support from those who like my work. 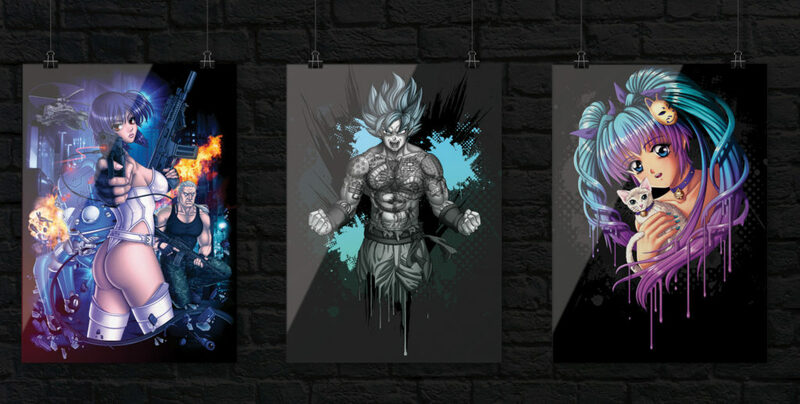 The best way to support would be to buy some signed artwork from the shop plus you'd have something cool to show for it. I've added a few new prints including my Alita and Harley Quinn marker pieces. 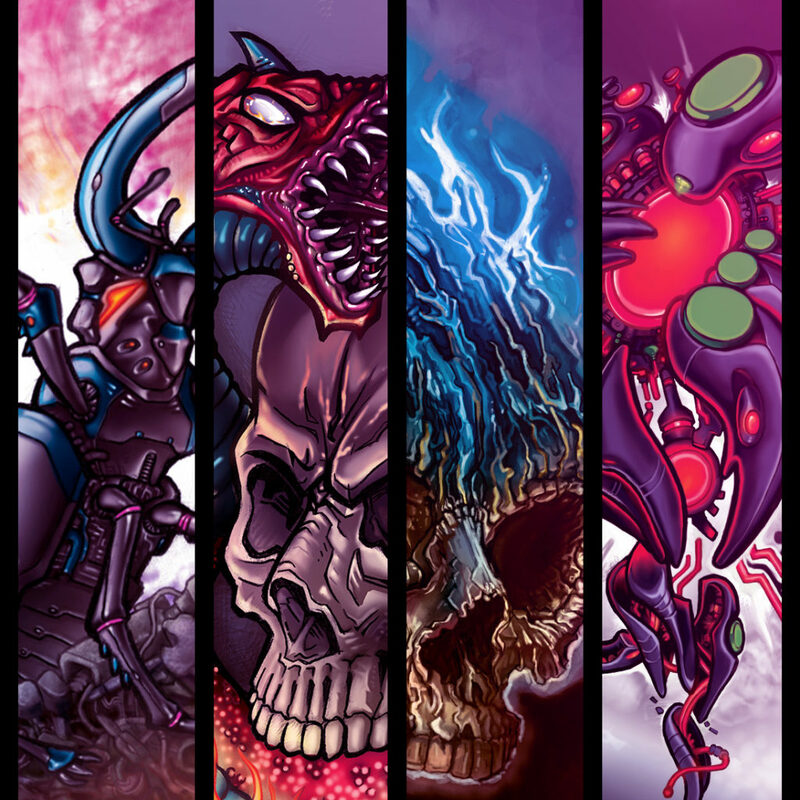 And if you want some custom-made artwork, check out the Hire Me section for more info.